Agriculture is a major industry in North Carolina (see Economic | Agriculture | Agriculture Overview). According to the North Carolina Department of Agriculture and Consumer Services, the agricultural industry “contributes $78 billion to the state’s economy, accounts for more than 17 percent of the state’s income, and employs 16 percent of the work force.” “Agriculture,” though, is a broad term that refers to the cultivation of soil for farming—encompassing everything from raising livestock to growing lettuce. The statistics given by the NCDACS include food production, but also include numbers for fiber production (such as cotton), non-food crops (such as tobacco), and forestry activities. In the past many North Carolina farms have grown only one crop, but recent agricultural trends—such as a decline in nationwide tobacco sales and higher demand for locally grown food—have encouraged farmers to invest in growing produce. Much of this produce is shipped out of the state, and only a small percentage of farmers sell their products to their own region directly to individuals for human consumption. This could include direct food sales at farm stands, farmers markets, and pick-your-own sites, along with many others. It excludes non-edible products such as nursery crops, cut flowers, or wool, but does include livestock sales. 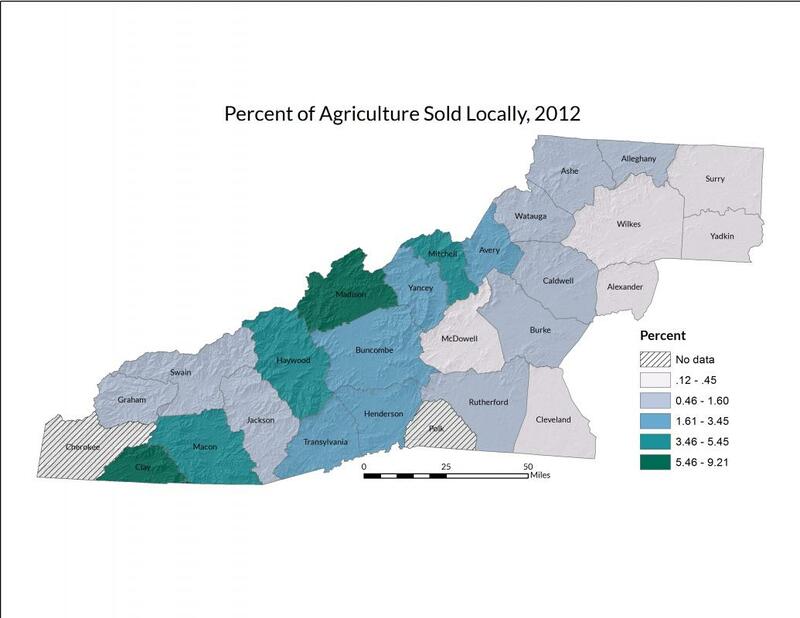 Of the 25 Western North Carolina counties for which data is available, 12 of them sell less than one percent of their food locally and directly to individuals for human consumption—the highest percentage of food sold locally is seen in Madison County, at 9.2 percent, followed by Clay County at 7.4 percent and Mitchell County at 5.4 percent. The annual revenue for this locally sold food varies greatly from county to county. According to the 2012 USDA Census of Agriculture, sales ranged from $9,000 in Caldwell County to $2,025,000 in Henderson County. The mean annual revenue for locally grown food in Western North Carolina was $377,370 dollars that year. Despite the relatively low numbers of locally grown food feeding the region, farmer-direct outlets are becoming increasingly popular. The 2007 Census of Agriculture found that farmer-direct sales in North Carolina increased 70 percent from 2002, and the 2012 Census of Agriculture reported that farmer-direct sales in the state totalled $31.8 million dollars. While farms can sell their produce directly to grocery stores, some of the most important outlets for local sales are produce stands, farm stores, and farmers markets. North Carolina is ranked tenth in the nation among states with the highest number of farmers markets, and the 2014 North Carolina Fruit and Vegetable Outlet Inventory found that the 27 counties of Western North Carolina host 231 farmer-direct markets. Despite the growing presence of farmer’s markets in Western North Carolina, not everyone is able to benefit from the availability of fresh, healthy food, most notably low-income families. Nearly 20 percent of the population of Western North Carolina receives SNAP or WIC benefits (see Food Assistance Needs). Some farmers markets in Western North Carolina, such as those in Ashe and Buncombe counties, are attempting to make themselves more accessible to low-income families by accepting SNAP and electronic benefit transfer (EBT) payments. According to the Appalachian Sustainable Agriculture Project, “from 2010 to 2013, the number of NC farmers markets authorized to accept SNAP/EBT increased 175%, from 24 to 66 markets.” Unfortunately, such programs are often difficult to maintain due to the licensing, paperwork, staff time, and fees involved. Further, nearly half of all markets in North Carolina are run by volunteers, and recent state regulations requiring certification of vendors and the keeping of daily records are making it increasingly difficult for unpaid managers to run markets effectively. Other factors exist to limit the access of low-income families to farmers markets. Eighty percent of farmer’s markets in the state are seasonal, resulting in a loss of access to local food during the winter months. Farmers markets are often not conveniently located to those who rely on public transportation, and many markets do not operate in any language other than English, thereby hindering the shopping experience of non-native or non-English speakers. Finally, locally grown food is often perceived as being more expensive than pre-packaged products or produce from large-scale growers, thus discouraging low-income families from making farmers markets part of their shopping routine. Since many low-income families lack the time or experience needed to prepare fresh fruits and vegetables, some farmers markets offer cooking classes or display signs detailing what products are in season and how to prepare them. Others are inviting conventional large-scale growers to sell at their markets, ensuring that lower-priced staples are available for low-income families. Farmers markets are also partnering with local churches, outreach centers, and public health departments to cross-promote nutritional services. Appalachian Sustainable Agriculture Project. Connect2Direct: Initiative Launched to Increase Farmers Market Sales and Local Food Access. Posted October 20, 2014. Accessed April 2015 from: http://asapconnections.org/connect2direct/. Appalachian Sustainable Agriculture Project. Local Food Sales Surge in WNC. Posted May 2, 2014. 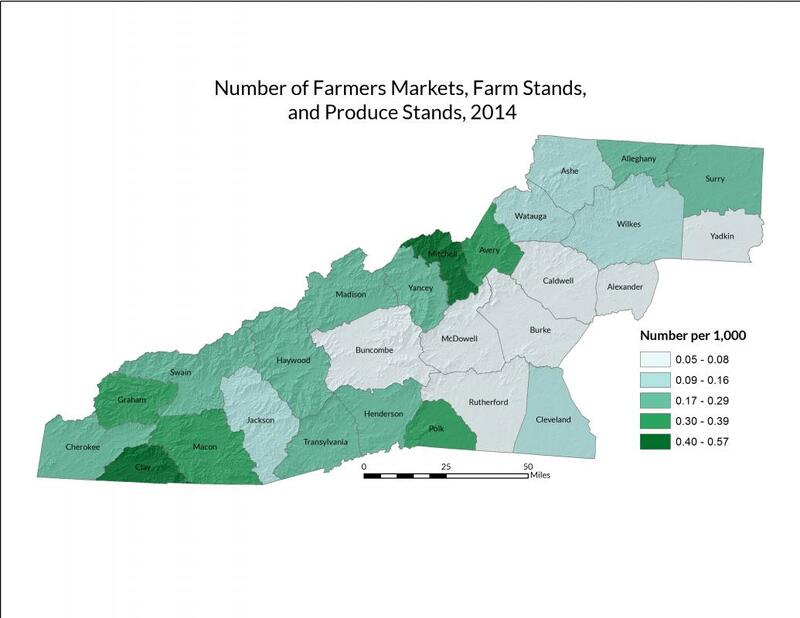 Accessed April 2015 from: http://asapconnections.org/press-releases/local-food-sales-surge-wnc-2/. Jackson, Charlie. Improving Access at NC Farmers Markets – NC Food Desert Committee Presentation [blog post]. Appalachian Sustainable Agriculture Project, 2014. Accessed April 2015 from: http://asapconnections.org/research/writings/improving-access-nc-farmers-markets-nc-food-desert-committee-presentation/. North Carolina Department of Agriculture and Consumer Services. North Carolina Agriculture Overview. Accessed March 2015 from: http://www.ncagr.gov/stats/general/overview.htm. U.S. Census Bureau. Small Area Income and Poverty Estimates. Updated December 17, 2014. Accessed April 2015 from: https://www.census.gov/did/www/saipe/data/model/tables.html. U.S. Department of Agriculture, Agricultural Marketing Service. Farmers Markets Directory Search. Accessed April 2015 from: http://search.ams.usda.gov/farmersmarkets/#. U.S. Department of Agriculture, National Agriculture Statistics Service. Census of Agriculture, 2007 Census Publications. Accessed April 2015 from: http://www.agcensus.usda.gov/Publications/2007/. U.S. Department of Agriculture, National Agriculture Statistics Service. Census of Agriculture, 2012 Census Publications. Accessed April 2015 from: http://www.agcensus.usda.gov/Publications/2012/.